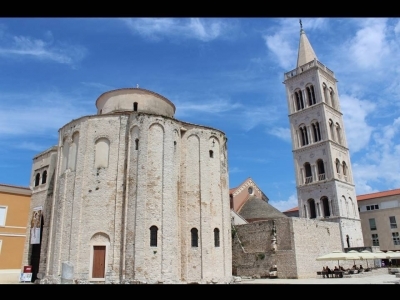 Zadar - Episcopal complex is part of the Tentative list of Croatia in order to qualify for inclusion in the World Heritage List. The Episcopal complex of Zadar includes the Roman forum, the cathedral of St. Anastasia, the archbishop’s palace, the church of St. Donatus, the Zmajevic seminary, the orthodox church of St. Elias, the Benedictine nunnery with the church of St. Mary and several other buildings / museums. The central point of this site is the main square with the ruins of the roman forum and the church of St. Donatus, with rotunda shape, with the cathedral tower on its side. The site is a fine and esthetic ensemble. St. Donatus and the cathedral are historical masterpieces. However, Croatia will have to make efforts in justifying the OUV and uniqueness of this place compared to other religious ensembles in the country. Extending the site to include the whole Zadar historic center would maybe be a possibility to explore considering the rich Venetian heritage also existing in the town in addition to Roman and Christian buildings.